"I am forwarding, herewith, the original writings for perusal". V. G. Carrington to the Secretary, Department of Home Affairs. 02/05/31. 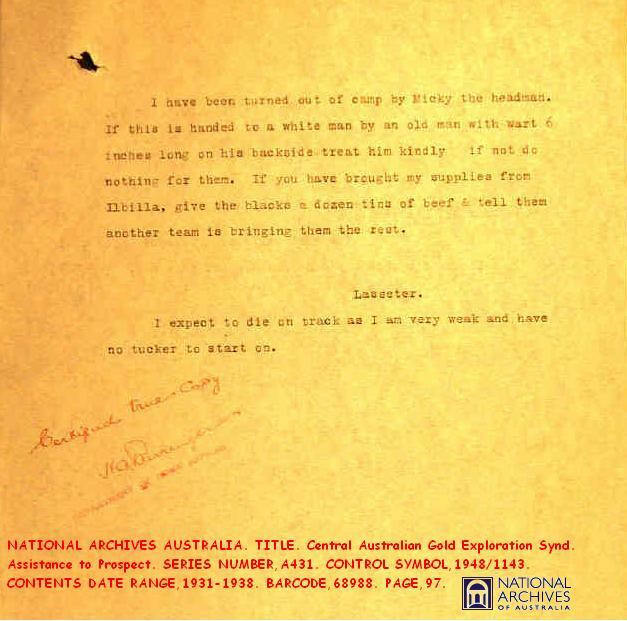 History thanks the bureaucrat in Arthur Blakeley's office who made, 'certified and true' copies of the original documents found on Lasseter's body by Bob Buck, Carrington too had an eye for history and in his letter to the Secretary, The Department of Home Affairs, made several pertinent observations regarding Lasseter's 'writings' and suggested that the letter to Lasseter's wife be forwarded to her and the remaining four documents be sent to the Central Australian Gold Exploration Co. as Lasseter's employers. It is well that Carrington sent the documents to his 'Head Office' rather than the Company, the only document to survive is the partial reproduction of the letter to Lasseter's wife opposite page 238 of 'Lasseter's Last Ride', no doubt purchased by Idriess. The four documents forwarded to C.A.G.E. have disappeared, but not before Idriess had carefully perused them in John Bailey's office. 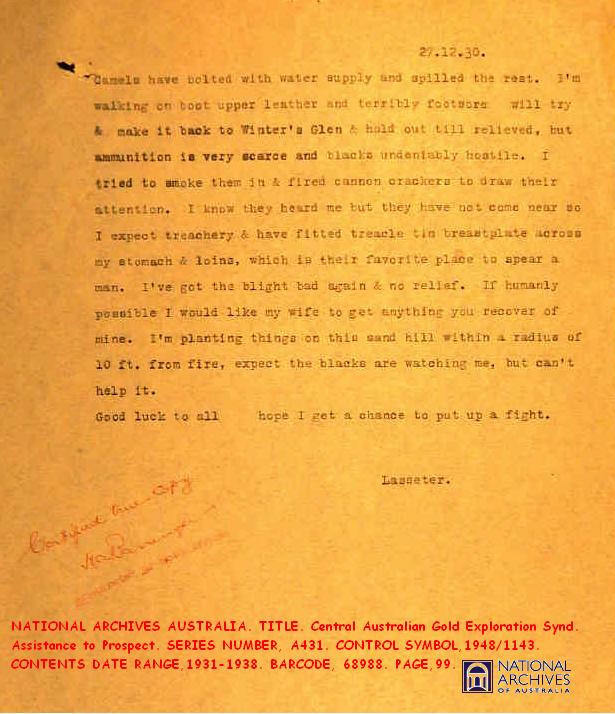 This letter was forwarded from Arthur Blakeley's office to Rene Lasseter on the 19th of May 1931 and appears to be the only letter received from her late husband while in Central Australia. 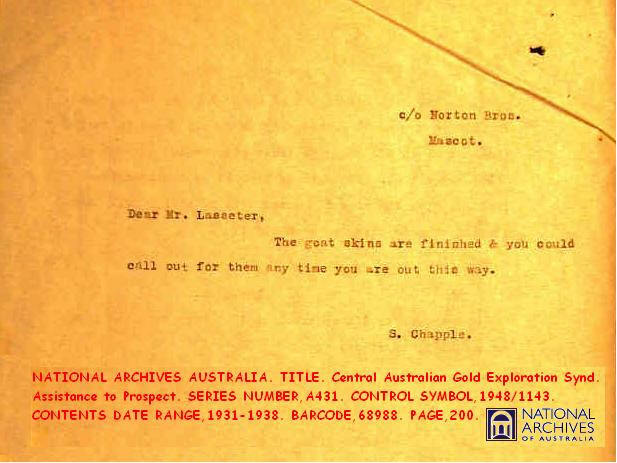 The letter was later purchased by Angus and Robertson and appears opposite page 238 of 'Lasseter's Last Ride'. No doubt with an eye to libel and future good relations with the A. W. U. Idriess has omitted Lasseter's reference to Jack Jenkins and the Argerol. This reference to Jenkins and the missing Argerol appears later in Lasseter's Diary. The original letter appears to have been written on the back of a telegram and fairly tightly folded, perhaps to fit into one of Lasseter's numerous Oxo tins. Writing LASSETERIA has it's funny moments, there would be a dozen stories in this note with shades of Ned Kelly and his armour. 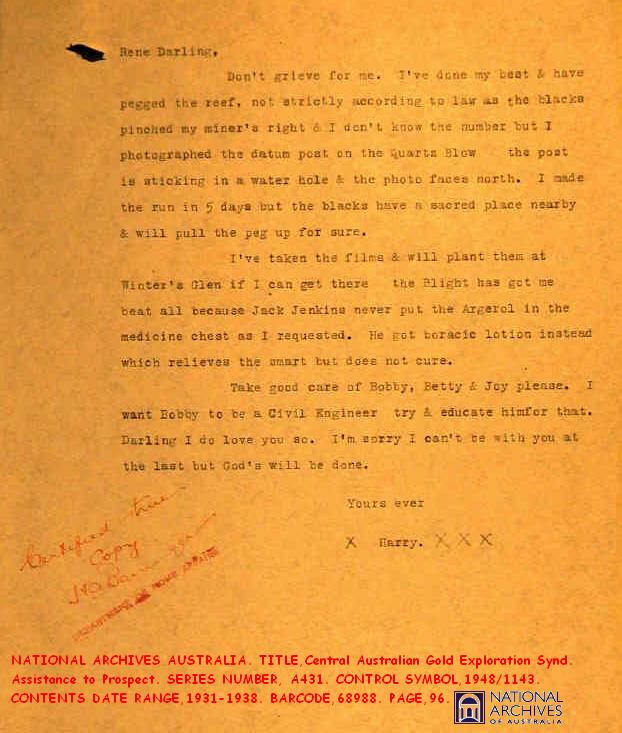 If the original is genuine then there are several implications for the common Lasseter story, not the least confirming Sullivan's Diary that the camels bolted on 27/12/30 and 78 days later is about the 16th or 17th of March 1931. Buck found Lasseter's decomposed body ten days later. The point being that Buck found a body to bury. If Lasseter had perished at the end of January there would have been scant evidence, if any, of Lasseter's remains, as it was Buck found the dingoes had already removed an arm. The note also suggests hostile relations between Lasseter and the Aboriginals, not surprising if one uses firearms and cannon crackers to attract their attention. Lasseter, and dare I say Idriess, seem completely unaware that smoke signals indicate friendly intentions in central Australia. 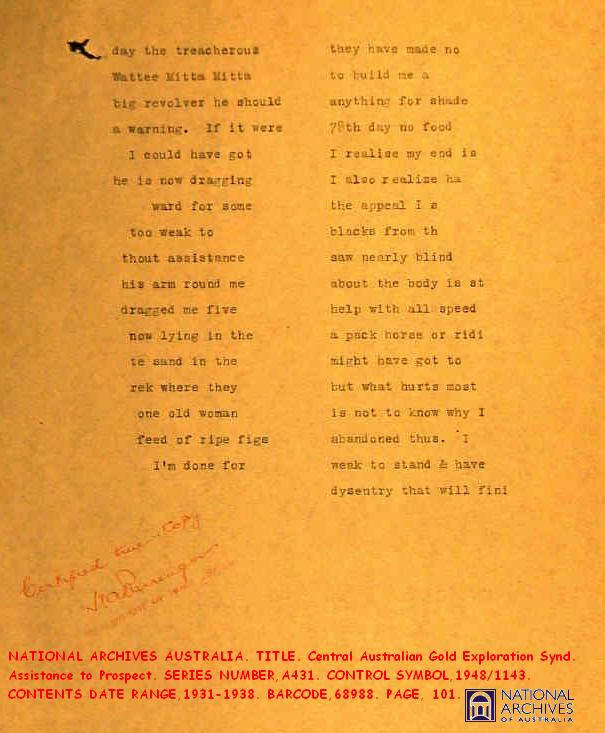 Coote, when stranded at Ayers Rock, also fired his pistol every night to attract attention and that it may have done, but the Aboriginal response would have been one of fear and disappearance from the vicinity, armed caution or open hostility, all perfectly understandable considering the Whitefellas recent activities in the Petermanns and thereabouts. The breastplate may explain the lack of treacle tins in subsequent searches for clues to the location of Lasseter's Reef, mindful of those found by Neville Harding in 1950. And poor Harry would take little comfort if he knew that a good sized 'hook' at the end of a strong young Wati's throw would pin him and his breastplate to any tree he backed against in his last stand, I like to imagine helpless mirth in Carrington's office when the above note was read. This document is meaningless as it does not give a reference point to the hill, the creek or "Eastward" of where?. And Lasseter, as well as Idriess and Coote are quite confused as to location, again referring to the cave on the Hull River as Winter's Glen. 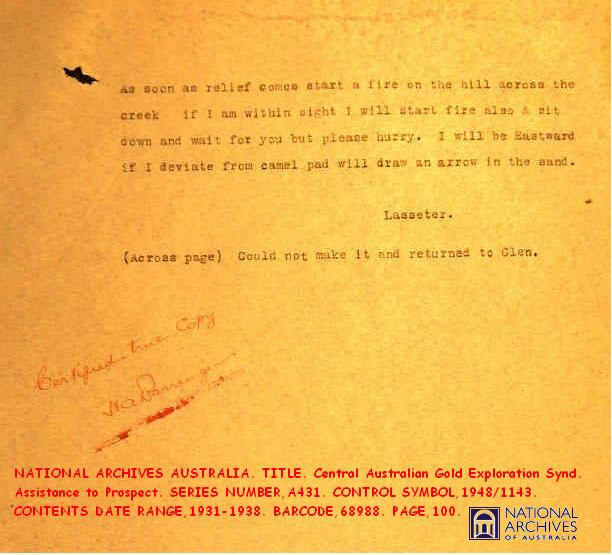 The context of the note is misplaced in that it should have been found elsewhere and not on Lasseter's body, that is the note was written with the intention of being found by the 'Relief Party', say at Lasseter's Cave and then deduce that Lasseter had travelled Eastward along the camel pad. Another document out of context, in this case the inference being that the note will be eventually handed to a Whiteman by Old Warts, but it is one of the five documents found on Lasseter's body. The note also has implications for the '78th Day' conundrum insofar it survived the ten or so days until retrieved by Bob Buck, if the note was written at the end of January 1931 Buck would have found nothing two months later. The last sentence raises the question, did Lasseter set off eastward immediately after the camels bolted on 27/12/30 or did he hole up in the cave on the Hull River for several weeks and only moved east after his supplies ran out. This document has been folded, hence the indented left hand column and incomplete endings to sentences and words on the right, indicating illegible or missing words from the exposed margins of the note. By inference the note has been written some 78 days after the camels have bolted with most of his supplies and Lasseter has survived largely on the generosity of some Aboriginals, but dysentery will finish him. As for Wattee Mitta Mitta, could he be "Micky the headman" who turned Lasseter out of camp? It seems 'odd' that Lasseter should subsequently learn the name and title of the allegedly arrogant and treacherous young Aboriginal leader, a doubtful position in an Aboriginal tribe anyway, generally being governed by a council of older and wiser men. The 'sixth' document of the five found on Lasseter's body, caused great puzzlement for a while, until it was realised that the hole made by the file pin was on the opposite corner of the original document, therefore the above is on the reverse side of either document three or four; giving Sullivan great comfort in knowing that the certified true and correct copies of the original documents are just that, down to recording any writing on the back of notes and indenting for missing words. Someone in Home Affairs was meticulous in their translation of the originals. At last, a possible explanation for the 'goat skins', a most practical item considering Lasseter's intended but secret travels to the Petermann and Rawlinson Ranges and perhaps points further afield. The explanation comes from Hermann Beckler's little known book, 'A Journey to Cooper's Creek', "Our best waterbags were the seamless, hairy goats' skins, but they were, of course, only small. However they frequently afforded us considerable service. Of these, the Indian models were also by far the best, proof of the high standard of Indian leathergoods." Beckler, who was Doctor and Botanist and probably the most competent member of the notoriously incompetent Burke and Wills expedition, also noted that, "Mr Wills had made a trip to the north of Cooper's Creek with McDonagh, and 90 miles from there their three camels disappeared without a trace during the ten minutes of the evening meal. The animals did not return: no-one saw them again. It was waterless country, there was only a small waterhole at the spot and the two of them had to walk back 90 miles in the greatest heat without any water apart from what they were carrying with them in two goat skins". Both C.A.G.E. expeditions have been likened to Burke and Wills on wings and wheels, and it seems that Lasseter did not collect the goat skins from Norton Brothers. Idriess, Ion. L. Lasseter's Last Ride. Chap 30. National Archives Australia. Central Australian Gold Exploration Synd. Assistance to Prospect. Series number A431. Control symbol 1948/1143. Hermann Beckler, A Journey to Cooper's Creek. 137,141,142.